According to a new Ontario survey conducted by Abacus Data, a majority of Ontarians (62%) oppose the Ontario Liberal Party proposal to introduce a $10,000 tax credit for business that hire newcomers to Ontario while 23% support it. A slight majority of Ontarians (53%) said that they had heard about the proposal before being surveyed while 47% said they were unaware. Awareness was higher among men (63%), older Canadians (75%) and among PC supporters (63%). When asked if they supported or opposed the proposal to give a tax credit to business who hire a highly skilled newcomer to Ontario, 42% strongly opposed the proposal while another 20% somewhat opposed it. In contrast, 23% either strongly (7%) or somewhat supported (16%) the proposal while 15% said they neither supported nor opposed it. Opposition was higher among men (65%), middle-aged Ontarians (69%), and PC supporters (85%). 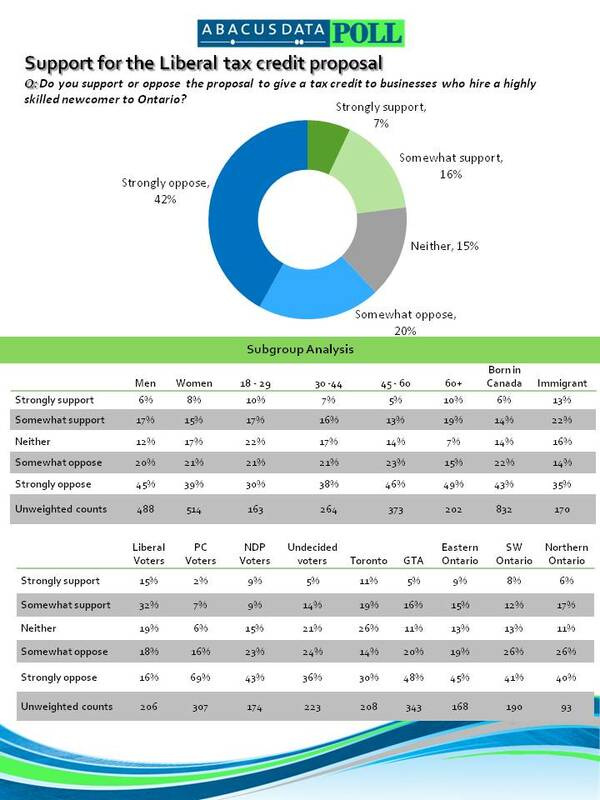 Support was highest among younger Ontarians (27%), Liberal supporters (47%) and Toronto residents (30%). Finally, respondents were asked whether the proposal would make them more or less likely to vote for the Ontario Liberal Party. Overall, 9% of respondents said they are more likely to vote Liberal while 50% said they are less likely. Not surprisingly, PC and NDP supporters were most likely to say they are less likely to vote Liberal. In contrast, only 15% of Liberal Party supporters said they are less likely to vote Liberal because of the proposal. Where the proposal is most likely to hurt the Liberals is with undecided voters. Forty-five percent of those respondents who have not yet made up their mind about which party to support said they are less likely to vote Liberal because of the proposal compared with 10% who said they are more likely to vote Liberal. The Liberal proposal to create a tax credit for businesses that hire highly skilled workers in Ontario is highly unpopular. What this poll did not measure was public reaction to how the issue is framed – ie. foreign workers versus skilled immigrants – and therefore it remains to be seen whether the proposal and the surrounding controversy around language and framing will lessen the impact on the Ontario Liberal vote support.